Lao Beng eats hawker food most of the time but there will be occasions when he will also try out food in cafes and restaurants. This is especially so if he does not need to fork out a single cent. Yes, Lao Beng is a cheapskate. My friend decided to treat me to lunch for returning a favour that I had helped in previously. We ventured into the lovely Kovan district one afternoon wanting to eat Thai food at Nakhon Kitchen but was met with a snaking queue. Plan B then I thought as we went into Knuckles Bistro located adjacent to it. 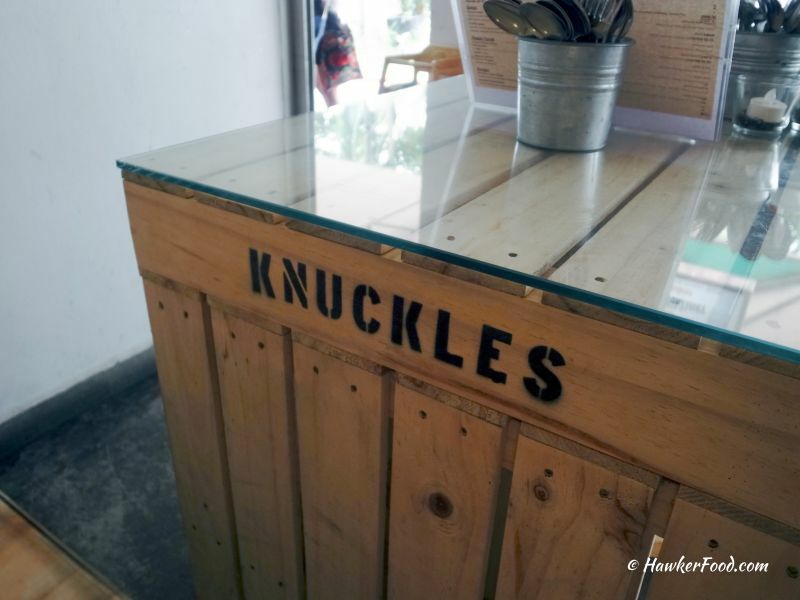 Knuckles Bistro serves western cuisine and as its names suggests, its signature dish is the German Pork Knuckles. 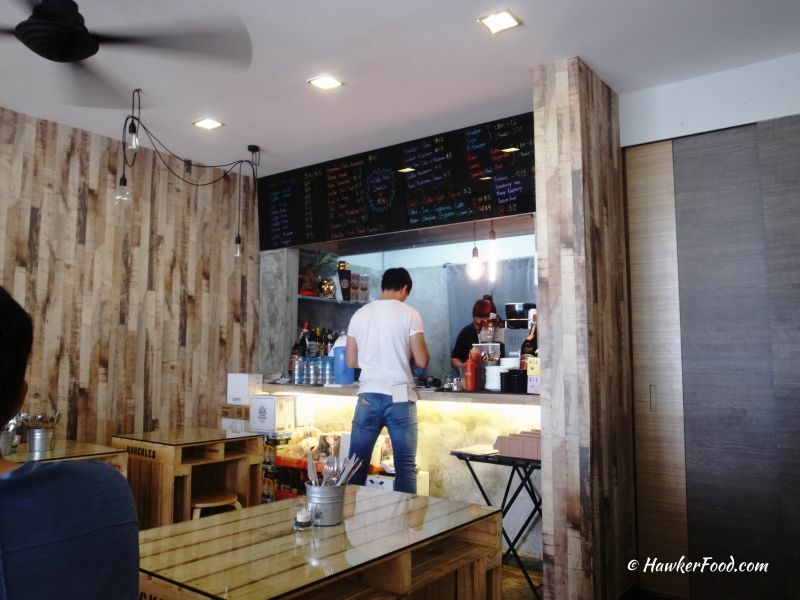 It also happened to be owned by the owners of Nakhon Kitchen. 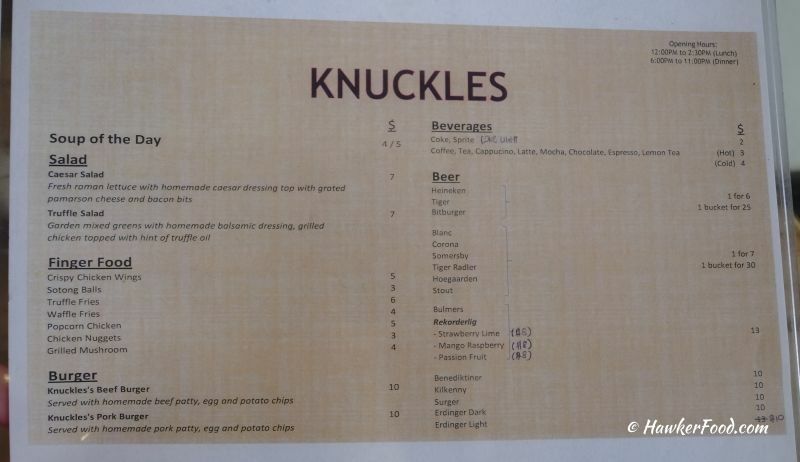 Browsing through the menu, you will notice that the items are priced reasonably. The truffle fries at $6.00 caught our eyes. They also serve a variety of beers, most notably the German ones. After deliberating for a while, we decided to order the Truffle Fries, German Pork Knuckles and Bangers & Mash. While waiting for our food, I started admiring the retro interior decor as its fittings reminded me of the old school industrial design. Ladies would probably love this place as the staff here seem pretty hunky. As we waited, I saw more people streaming in. These people were probably the same group who queued at the tail end for Nakhon Kitchen. 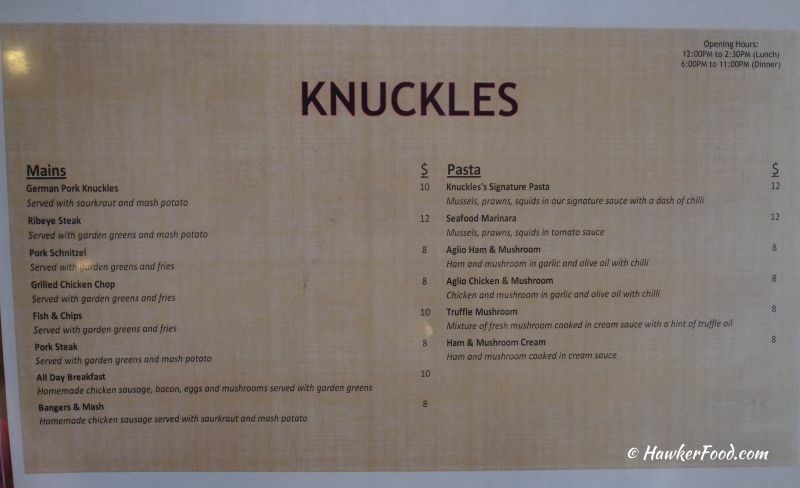 Then, there was another couple who stopped outside Knuckles and started pointing at the Nakhon Kitchen queue before deciding to settle themselves into Knuckles Bistro. My Plan B was in fact the owners’ Plan B, a very smart move I should say. Instead of losing potential customers, they added another eatery right beside its most popular one, making it everyone’s else Plan B. “Sibei smart” I whispered to myself. Truffle fries!! The serving was generous for its price. 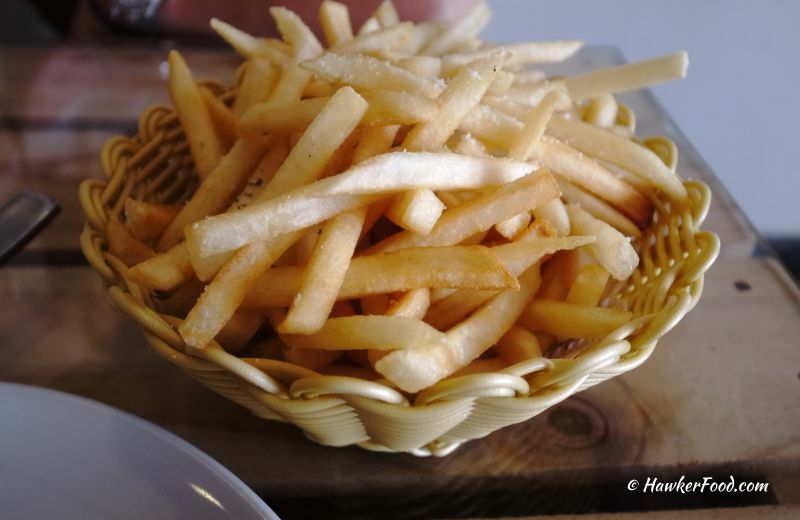 The piping hot, crispy fries was not too salty and had strong hints of truffle oil. 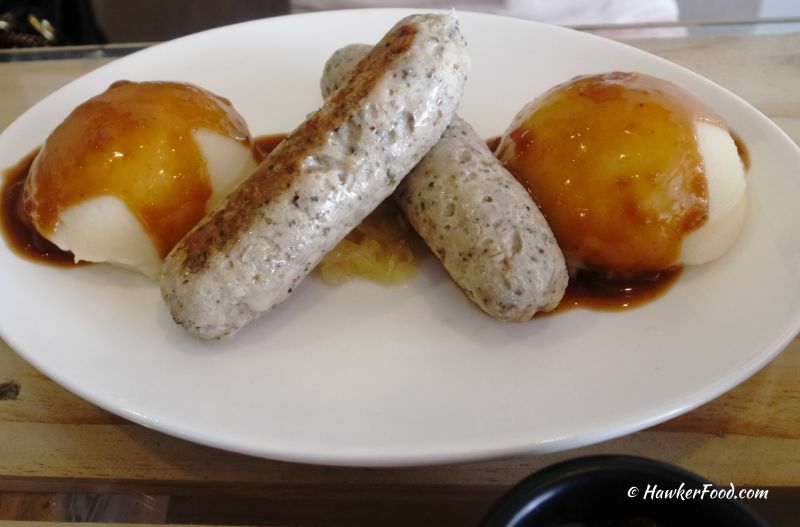 My friend’s Bangers & Mash which cost $8. I was told that the sausages were meaty and rather flavourful. 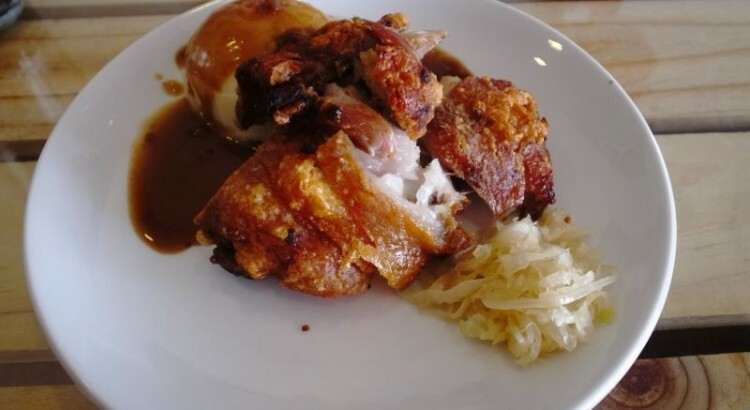 My German Pork Knuckles which cost $10 were served together with mashed potato and sauerkraut. The sauerkraut was not too sour and I was able to finish them at one go. 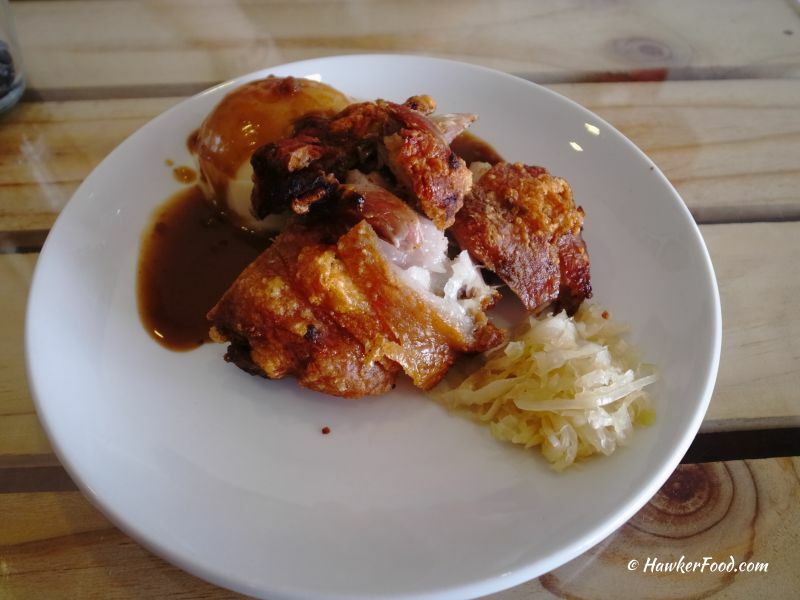 The serving of the pork knuckles was in my view generous considering its price. I started dissecting the boneless pork knuckles and began my assault on it. 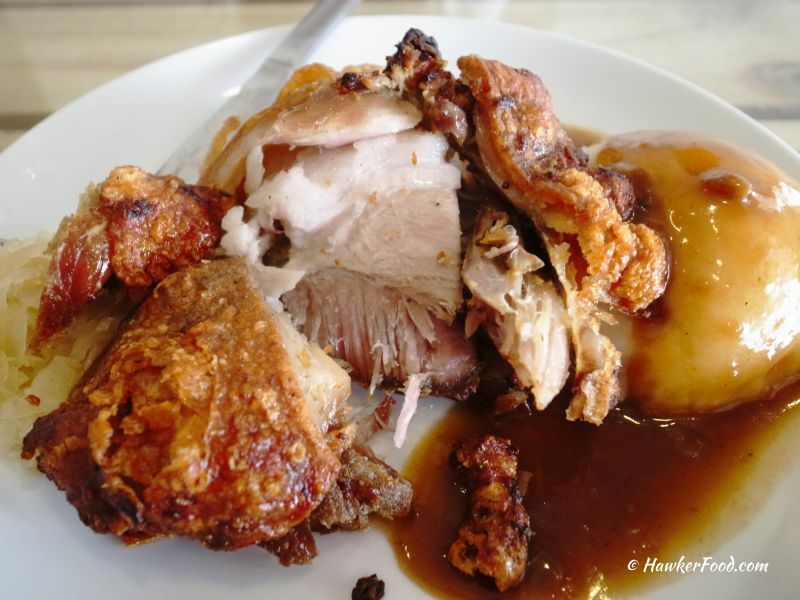 I loved the crunchy and crispy skin, the meat was slightly juicy and chewy. With the mashed potato, it made my meal complete. It was pretty filling for me at the end of it. In the end, Lao Beng had to pay…..
Tasty Western cuisine that is affordably priced; with no GST and service charge, this is a great choice for you if you would like an affordable upgrade from your usual fare.